Center-running transit lanes are particularly suited to high-ridership rapid transit routes, affording on-street transit a level of accommodation approaching that of transitways. 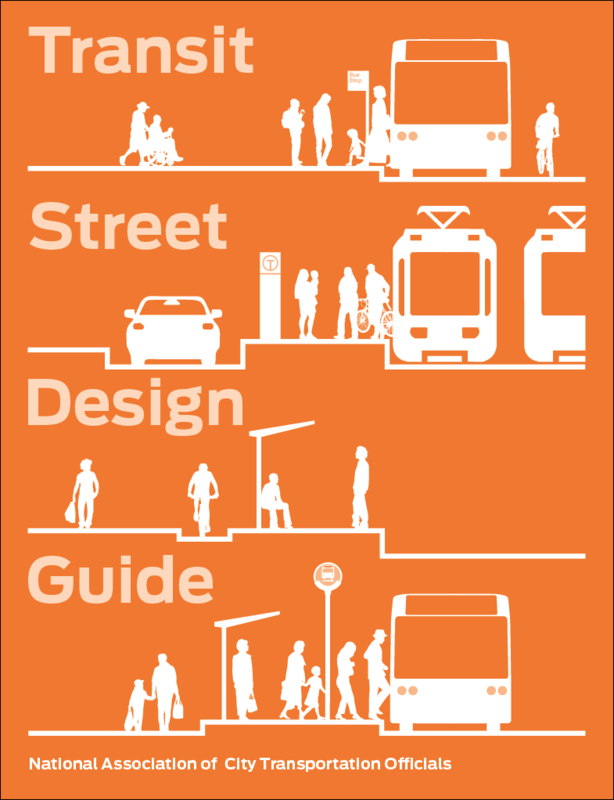 On streets with two or more travel lanes in each direction, and especially streets with existing center-running streetcars, service can be substantively improved by dedicating the center travel lanes to transit and installing accessible boarding platforms. This combination provides many of the benefits of LRT or BRT in a core urban setting. On this street, a center-running streetcar route has been retrofitted for longer LRVs and buses, with extended platforms and exclusive use of the center lanes, while using the existing tracks and catenaries. Lower-cost implementations focused on building simple, safe boarding islands can also succeed at a widespread system transformation. Transit vehicles move in a straight line. At stops, parking is prohibited and the general traffic lane bends around the platforms to the right, as a curbside lane. A similar arrangement is used to create left-turn pockets where needed. Using a very low design speed results in short, space-saving transitions. Stations are built on raised platforms in the roadway, staggered across the intersection as far-side stops to conserve street space. Passengers are directed to crosswalks using station furnishings, such as lean bars, shelters, plantings, short vertical barriers, and both visual and tactile cues. Left turns across the center transit lanes are either restricted or accommodated with separate phases to prevent direct conflicts with transit vehicles. Lagging left-turn phases allow transit and parallel pedestrians to cross before cars turn, improving safety by encouraging pedestrians to cross with the signal. Refuge islands are used to channel the flow of traffic, “shadowing” the left turn lanes and shortening pedestrian crossing distances. Transit signal heads are used at intersections to reduce driver confusion and the risk of turn conflicts, especially where TSP is used. Sightlines between the station and the sidewalk are preserved to ensure the visibility and safety of waiting passengers. Advance or adaptive transit signal priority detects transit vehicles as they progress through the corridor, allowing pedestrians safe crossing time while truncating red phases to allow transit to arrive on green phases. Spreading phase modifications through multiple intersections reduces impacts to general traffic flow (see Turn Restrictions). Off-board fare collection at stations enables all-door boarding, reducing stop dwell time and travel time variability.